Whether you are making your first trip to Cape Cod for that much needed vacation or are on your annual chill, there are a few things you should avoid if you want to have an enjoyable stay. We hope your trip includes a stay at our Cape Cod bed and breakfast in historic Sandwich Village. But most of all, we hope your time spent on our rock is memorable in a good way, and that these suggestions will help make it so. Transportation – Bring a car! Public transportation on Cape Cod is not a myth, but close to it. The Cape is 65 miles long and 25 miles at the widest part. If you are hoping to see the scenic beauty of Cape Cod, you cannot do so without a car. And don’t even think about taxi service. If you are able to locate a taxi, the cost will leave you breathless. Crossing the Bridges – There are two means of getting onto and off of Cape Cod; the Bourne Bridge and the Sagamore Bridge. The traffic onto the Cape on Friday evenings and off the Cape on Sunday is very heavy, due to the fact that so many folks who have weekend or summer homes here come down on Friday evening and leave on Sunday. You are advised to make the crossing any other time if at all possible. If you cannot avoid crossing on Friday, try to make it as early in the afternoon as possible. On Sunday, if it is a rainy day, folks will leave the Cape in the morning. If it’s a sunny Sunday, people will stay at the beach as long as possible and will therefore be leaving later in the day. If you keep that in mind, you may be able to avoid the long wait crossing the bridges. Traffic – It’s Cape Cod, one of the most popular resort areas in the country. Just accept it. If nobody wanted to come here, neither would you. The heaviest time of the year for traffic is the summer months. If you plan your vacation for May or early June, you may not have as many beach days, but the traffic is certainly lighter. Although Cape Cod is thought of more as a summer destination, many people come here in the fall because the weather is great and it is so beautiful that time of year. It may not be beach weather, but there is so much more to the Cape than just amazing beaches. Rotaries – Yes, those are those circular things located in many areas of Cape Cod. If you cross onto the Cape via the Bourne Bridge, the first thing you will encounter is a rotary or traffic circle. Traffic travels counter-clockwise and you enter and exit from the outside lane. The first time you encounter one is a bit nerve-wracking but you’ll get used to them. Just remember that the car already in the traffic circle has the right-of-way. Just a warning, some folks here enter a rotary with the belief that you only have to give up the right-away if you make eye contact with another driver. Fender Benders – The traffic in many of the areas of Cape Cod moves slowly during the summer months, especially along Route 28. Try not to get impatient. If you have a fender bender, not only will it ruin your vacation, but you will really upset the people who have to sit in traffic waiting for the mess to be cleaned up. Biking – Whether you bring a bike or rent one when you arrive, there are lots of great bike paths throughout the Cape. Ride to your heart’s content but stay off Route 6A and Route 28, for your safety and so that you don’t add further to the angst of people who are driving in heavy traffic along these narrow roads. Diets – Oh, come now! You ate lettuce for a month before your vacation so, live a little. The Cape is covered with seafood restaurants and what could me more healthy. Fast Food – Save it for when you are at home. Cape Cod has so many wonderful places to eat that you can try a different one for every meal. Seafood is fresh and plentiful here at restaurants and at the ubiquitous Cape Cod seafood shack. Just about every village has one and the experience is quintessential Cape Cod. Crowded Restaurants – This is to be expected during the summer months. Make a reservation if you can and be on time so that you don’t lose your table. If you have to wait, try to be patient. Again, if no one wanted to eat there, neither would you. If the crowds are just too much for you, keep in mind that people flock to places to eat after being at the beach all day. Going a little earlier or later than the normal dinner hour may help you to avoid long waits. Keep in mind though that many places here stop serving around 9:30 pm. You may want to check with someone local to see which places serve late into the evening. If you are staying at a bed and breakfast, your innkeeper will know the best places to go. Shopping – If it is raining, everyone will be shopping and restaurants will be full. Note: the Christmas Tree Shop only sells Christmas stuff during the Christmas season. Social Networking Sites – You have got to be kidding! Don’t you get enough of that at home? Besides, do you really want people to know where you are? Give it a rest and enjoy a good book at the beach. Then, you will have lots to share when you get home. Email – See above! Besides, it’s probably work and you came here to get away from that. Beach Parking – Most beaches on Cape Cod charge a fee for parking during the summer months. The price ranges from $10 to $15 per day. So, you see a place where you can park your car along the side of the road near the beach to avoid paying to park. Come on folks, it’s the beach and there is sand. If you get your car stuck, don’t expect too many folks to stop and help you. Most will drive by rolling their eyes and thinking what an idiot you are. Save yourself the embarrassment and the expense of calling a tow truck. watching, you can avoid any stomach discomfort by chewing a bit of ginger. It’s good for you and why take a chance on spoiling the experience if you are prone to seasickness. Sunburn – The most common self-inflicted vacation hazard. Don’t spend the rest of your vacation huddled in the shade wearing long sleeved clothing and wincing if anyone comes within a foot of you for fear they may bump into you and cause hideous pain. Sharks – Yes, there are occasionally sightings of these creatures in the waters around Cape Cod. Avoid being lunch if you possibly can. Seals – Many areas of the Cape are home to these adorable mammals. They like to sun themselves on the beach. Do not approach them or try to feed them. They can be dangerous. If you think one is hurt and in need of assistance, call 911 and report it so that the proper people can come to its aid. 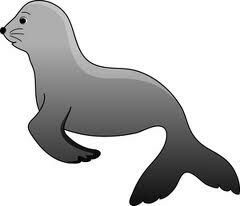 Also, be aware that sharks love to munch on seals and where they are plentiful, so may be the sharks. You may not want to wear a dark wet suit and swim near the seals. Jelly Fish – If you see them in the water, avoid them if you can as they may not avoid you. If you see them on the sand at the beach, they look like a bubble of jelly. It is not wise to step on them. Day-tripping to Nantucket or Martha’s Vineyard - The ferry to Nantucket leaves out of Hyannis and you cannot take an automobile. The island is small and easy to get around on foot, by bike or moped, and rental cars are quite reasonably priced. The ferry to Martha’s Vineyard leaves from Woods Hole and if you are thinking about taking an automobile, check with the Steamship Authority ahead of time for available space and cost, as it is quite expensive. It is wise to park at one of the Steamship parking lots in Falmouth and take the shuttle to Woods Hole. During the summer months, some 22,000 or so people day-trip to the Vineyard each day. There is a small, pedestrian ferry (The Island Queen) that departs from Falmouth Harbor. It is inexpensive and great fun. Cape Cod is an amazing place to vacation. Our quaint villages are each unique and charming and our history is your history. Strolling through the streets and back roads of Sandwich, the oldest of our villages, is a walk into the past. Come visit us and you’ll see. Tired of giving your Valentine the same roses and chocolates for Valentine’s Day? 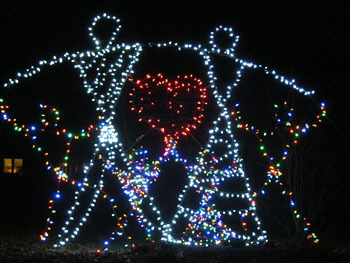 While that is a lovely gift, we wanted to do something a bit different this year at our Sandwich bed and breakfast. We are not usually open in the winter, as we head towards warmer parts of the country in our motor home with our kitty. However, kitty has been ill and is not quite well enough to travel. Those of you who have been guests at our inn probably know that I go nowhere without kitty. That being the case, we decided to stay open until kitty’s doctor gives him the ok to travel. We tossed around several ideas for packages to offer our guests for Valentine’s Day, but nothing seemed to excite us. February 14th this year is on a Tuesday, which means that people will celebrate either the weekend before or after. Since President’s Day Weekend is right after Valentine’s Day, we thought that would be a great time to celebrate. As we were pondering what to do, a unique opportunity presented itself. Our quiet and quaint little village harbors some quite extraordinary folks. One such person is world-class Chef Robert Smith. He and wife, Peggy, own and operate Smith on Main, a first class catering business. Robert has cooked for the rich and famous and has been private chef to the well-healed and well-known in the Caribbean, Boston, on Nantucket, and Cape Cod. Timing is everything and was such that Robert was available and willing to create a special Valentine’s dinner menu and prepare it for guests at our inn. 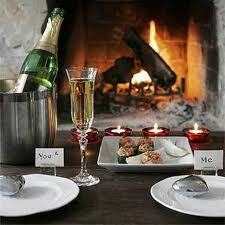 We are very excited about offering our first ever Valentine’s Dinner Celebration at our inn. The package includes: two nights at our bed and breakfast inn on Presidents Day Weekend; a wine tasting on Friday night, February 17th; tickets for guests to visit the Sandwich Glass Museum; a hearty and healthy breakfast each morning; and a dinner on Saturday, February 18th that is sure to be an epicurean delight, complete with wines selected to go with each of the 4-courses. Space for this dinner is limited and we are almost booked out already. For more details, see our "Specials & Packages" page on our website. If you would like to join us for this very special weekend, you can book the package online from our website or just give us a call at 508-888-6958. For a copy of the dinner menu, send and email request to info@innatsandwich.com. Sandwich is truly a bright spot during the Christmas and New Years holidays. Olde Sandwich Village, where our Cape Cod bed and breakfast is located, is ablaze with lights from the town Christmas tree across the street and all the decorated stores and residents. Our guests also enjoy the Heritage Museums and Gardens’ Gardens Aglow where the hundred acres of gardens sparkle with millions of lights. The biggest treat for the eyes, both literally and figuratively, may be the Michael Magyar created "Giant Light Sculptures". Michael Magyar is a very talented, master glass blower who owns the Glass Studio on Cape Cod, located at 470 Route 6A in East Sandwich. 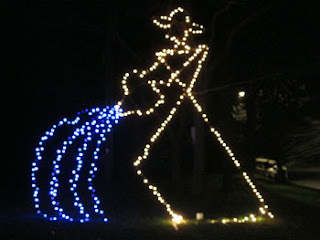 A few years back, Michael fashioned an image of a glass blower out of metal and accented it with multi-colored lights as a Christmas decoration. 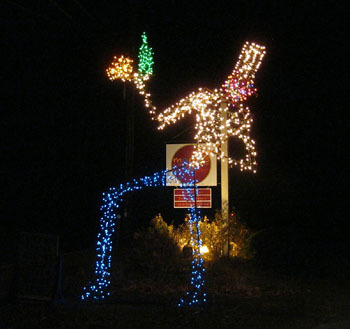 His lighted “Giant” stood out along 6A and creatively marked the site of his business. I started to notice his giants in 2007, when he gave two angels to the Sandwich Chamber of Commerce to stand in front of the office, then located on Water Street. The boy and girl angels were to commemorate the tragic deaths of two local Sandwich teenagers that year. Since 2007, the Giants have grown like wild flowers; Magyar has created over 20 of these 14 to 17 foot tall decorations, most on public display. It now is a Christmas tradition of ours, and a suggestion that we make to our guests, to drive through town at night to view these works of art. I love to hear the response of our guest the next morning around the breakfast table as they excitedly recall their “Giant” sightings. 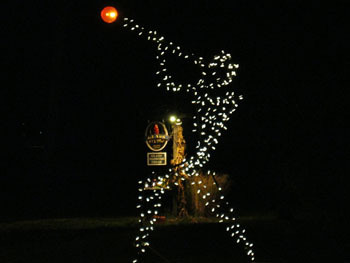 The Giants really come alive after sunset when all the lights are on, and to see all of them you should travel east on 6A from Sagamore towards Barnstable. The two original “Angles” are now located on either side of the “Entering Historic Sandwich 1637” sign at the intersection of Route 130 (Main Street) and 6A. With a quick detour into the Sandwich Village, you can see some of the newest Giants. Either take Main Street or stay on 6A to Tupper Road and take a right to the intersection of Tupper and Main to see the beautiful new Dolphin in front of the Sandwich Glass Museum, which is located across the street from our Sandwich Inn. A turn down Main Street takes you past the huge “Daniel Webster” giant holding a book in front of the Dan’l Webster Inn & Spa, I thought it was a caroler the first time I saw it. Almost immediately across the street is the new “Old Man Winter” blowing wind off the top of The Weather Store; this is the only Giant mounted on a building instead of being free standing on the ground. A block further on Main, on the left, you see the very colorful logo of Saint John’s Episcopal Church. The rest of the Giants are on 6A going east past where Main Street merges into Route 6A. First you will see the “Crow” of Crow Farms on the right. Next, on the left, is the “Gardener Pouring Water” at Scenic Roots, then on the right, the “Lobster Man” at Salty Lou’s. Further down and still on the right is the “Honey Bee” at the Beehive Restaurant, the “Damsel Fly” at Damsel Fly Gallery, and the “Colonial Guy” at Titcomb’s Bookstore. Then, on the left, the “Sand Dollar” at Sand Dollar Real Estate, and back on the right, the one that started it all, the “Glass Blower” at Magyar’s studio. Next is another “Angle” for the Float Foundation, then on the left is Riverview School’s “Student with Backpack”. As you continue driving, on the right you will see the “Juggler” at the Black Crow Gallery, then the “Chef” at Momo’s Food Emporium. Finally, on the left, the “Family of Love” for the Universal Peace Federation near the Sandwich town line at West Barnstable. A few more Giants are on 6A in Barnstable, but I have not seen them. 6A was still ablaze with Giants on New Years day as we drove from a dinner party in East Sandwich back to our Sandwich Bed and Breakfast. There is no official end date for the Giant displays and some merchants may be planning to leave them up year round. We are open and when you stay with us, over a wonderful breakfast I’ll share with you my unofficial “Giant’s” trail map for your viewing pleasure after sun down.